345 driver confused at Stratford? One of TfL Rail’s Class 345’s (one-day-to-be an Elizabeth Line train) an eastbound ex Liverpool Street heading for Shenfield had its doors opened on the wrong side at Stratford. The train was the 21.27. The reasons for this incident are so far not known however one person said the driver had to be ‘woken’ to the fact the doors had been opened on the wrong side – which indicates a likely driver error. It seems from this particular tweet (which can be seen below) the driver was perhaps not even aware the doors on the wrong side had been opened. Maybe he somehow thought it was Maryland rather than Stratford? We have all done these sort of things and such human lapses are inevitable – however it begs the question why there was no automated override to prevent it. It is said the 345’s have a system known as Correct Side Door Enable (CSDE) which ensures they only open their doors on the side intended. I do not know if this was in use. The TfL trains can use alternative platforms at Stratford and most are reversible anyway so perhaps it was down to the driver to ensure he knew which platform he was at. One thing that can be inferred from this tweet is the driver of the train in question had not known the doors were open on the wrong side. If one watches the videos in question there was no immediate reaction to the doors being open on the wrong side. There was a lengthy pause in closing these – which does rather indicate its driver was likely unaware – and inferring from this very same tweet it seems this class 345 driver was somehow not fully in control of his train. @TfLRail 21:27 train at Stratford opening the doors on the track side rather than platform side. Not safe at all … surely the driver knows he’s left from he’s right.. The somewhat awkward layout at Stratford is a result of track rationalisation in the 1990s when the fast tracks were reduced from four to three to enable higher train speeds as well as bi-directional routeing and offering more flexibility. Its not really an ideal arrangement though as freight trains have to run against the main fast lines from Liverpool Street in order to gain their North London route. What it means is trains can arrive at platforms other than the intended ones and have to use different doors – although that was not the case with the Shenfield bound train in question. In April last year a woman had to travel from Stratford to Manor Park with her fingers stuck in the train’s doors and its somewhat surprising the class 345’s equipment did not detect this. Trains do reverse at Stratford when there are problems or perhaps need to be turned back early. 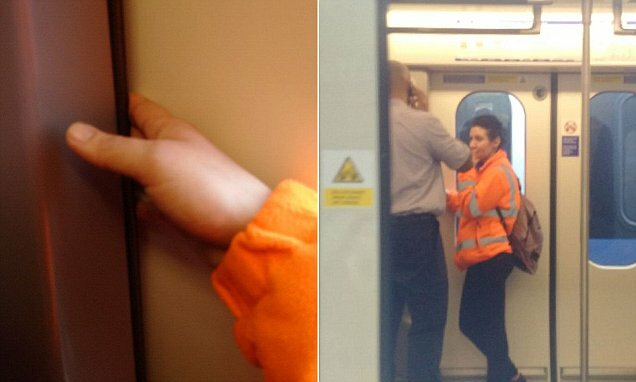 Perhaps these moves (as well as wrong side ones) will need to be banned completely before these 345’s can fully employ protection measures to stop any incorrect doors opening? @BombardierRail do your crossrail stock have safety features to stop doors opening on the wrong side? That may not even happen until the Elizabeth Line comes fully into play (in other words the central core section between Pudding Mill Lane and Paddington.) It is evident from the very first day of through working between Shenfield and Paddington/Heathrow the 345’s will invariably be limited to Stratford’s platforms five and eight as these will be where the interface between traditional rail signalling and automated operation begins or ends. What this means is the 345’s will switch to/from CBTC whilst stationary at the platforms. For the sake of extra safety it may be better the limited services to Liverpool Street main line station are dispensed with and the services totally concentrated on the core CBTC route. Update: This report from the Standard (21st January) is quite worrying. It implies there was a delay of a few minutes before the driver realised his doors were open on the wrong side of the train. In that time passengers were able to open the doors if they so wished onto the wrong side of the train.